As America reacts to Edward Snowden’s leaks about NSA surveillance, American Privacy offers a timely look at our national experience with the right to privacy and the evolution of communication, from broken sealing wax to high-tech wiretapping. 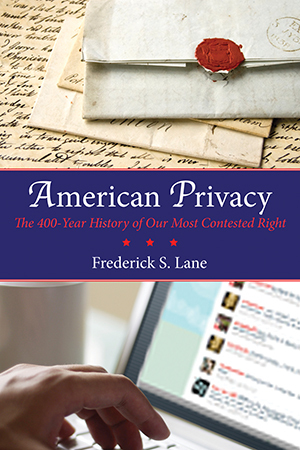 “The history of America is the history of the right to privacy,” writes Frederick S. Lane in this vivid and penetrating exploration of our most hotly debated constitutional right. From Governor William Bradford opening colonists’ mail bound for England, to President George W. Bush’s expansive domestic wiretapping, the motivations behind government surveillance have changed little despite rapid advances in communications technology. Yet all too often, American citizens have been their own worst enemies when it comes to protecting privacy, compliantly forgoing civil liberties in extreme times of war as well as for everyday consumer conveniences. Each of us now contributes to an ever-evolving electronic dossier of online shopping sprees, photo albums, health records, and political contributions, accessible to almost anyone who cares to look. In a digitized world where data lives forever, Lane urges us to consider whether privacy is even a possibility. How did we arrive at this breaking point? American Privacy traces the lineage of cultural norms and legal mandates that have swirled around the Fourth Amendment since its adoption. In 1873, the introduction of postcards split American opinion of public propriety. Over a century later, Twitter takes its place on the spectrum of human connection. Between these two nodes, Anthony Comstock waged a moral crusade against obscene literature, George Orwell penned 1984, Joseph McCarthy hunted Communists and “perverts,” President Richard Nixon surveilled himself right out of office, and the Supreme Court of the United States issued its most influential legal opinions concerning the right to privacy to date. Captured here, these historic snapshots add up to a lively narration of privacy’s champions and challengers. Legally, technologically, and historically grounded, American Privacy concludes with a call for Congress to recognize how innovation and infringement go hand-in-hand, and a challenge to citizens to protect privacy before it is lost completely. Following the 9/11 attacks, the NSA intensified its tracking of calls and e-mails to and from known Al Qaeda figures, aided in large part by Central Intelligence Agency seizure of terrorists’ cell phones and computers in the Middle East. With President Bush’s executive order in hand, the NSA for the first time began also tracking domestic phone calls and e-mails of people, including U.S. citizens, suspected of having links to Al Qaeda, regardless of how remote those links might be. Ten days later, after the Bush administration admitted that the NSA had conducted warrantless surveillance of “several hundred” Americans, the Los Angeles Times published a story, under the headline “U.S. Spying Is Much Wider, Some Suspect,” in which various security experts suggested that the NSA was actually conducting wholesale, “look-at-everything” surveillance. As the Los Angeles Times itself conceded, the article and its conclusions were largely speculative, since none of the surveillance experts interviewed had any specific evidence regarding the full extent of the NSA’s domestic spying program. But the quintessential “black” agency was about to get a little bit grayer. It turned out that the NSA was in fact “looking at everything,” or at least had the opportunity to do so. Information about the secretive National Security Agency has been notoriously difficult to obtain since the agency was quietly established by President Truman in 1952. The existence of the agency itself didn’t actually remain a secret for all that long: the following summer, the New York Times reported that the Defense Department was launching a $30 million construction project to build a new home for the agency at Fort Meade in Maryland. But little information was available about what the agency would do in its new home. When President Bush freed the NSA from its warrant requirements under federal law, the NSA decided to take a more straightforward approach: directly intercepting the data transmissions flowing through the nation’s largest and busiest telecommunications companies. In January 2003, an AT&T communications technician named Marty Klein noticed that a new room was being built next to AT&T’s 4ESS switching equipment in the San Francisco office in which he worked. The switching equipment, Klein later told Wired magazine’s Ryan Singel, handles all long-distance and international calls. Klein subsequently learned that the person setting up the equipment in the new room had been recruited the previous fall by the NSA. Among other things, Klein reported, the secret room was equipped with a Narus STA 6400, a supercomputer that is part of the NarusInsight Intercept Suite (NIS). In a product description on the Narus Web site, the company says that the NIS “provides service providers and government organizations unmatched flexibility to intercept IP [Internet protocol] communications content and/or identifying information, enabling law enforcement and government organizations around the world to effectively gather evidence of illegal activity in the multi-faceted world of IP communications.” In simpler terms, the NIS is designed to collect huge amounts of data from various types of data networks and apply so-called “semantic traffic analysis” to determine whether any of the traffic contains information of interest to the organization collecting the data. Since 2004, the Narus board of directors has included William P. Crowell, an “independent security consultant” whose prior positions include deputy director of operations and deputy director of the National Security Agency.